ALLSTON Harold Brown’s Hamilton Company has filed plans with the Boston Redevelopment Authority for a three-phase, $85 million mixed-use development encompassing more than 2 acres in Allston. When integrated with its 24 existing holdings in the Packard’s Corner area of Allston, the new streetscape will transform the area into a “home destination” for renters currently priced out of Boston’s increasingly expensive housing market, according to a press release. Brown, a resident of Brookline, wants Packard’s Corner, once home to a long-defunct automaker, to be renamed as “Packard’s Crossing,” predicting that families and individual renters will “cross-over” into Allston from other parts of Boston and beyond. Hamilton’s Packard’s Crossing streetscape will extend from Commonwealth to Harvard avenues with Brighton Avenue as the major interconnector. 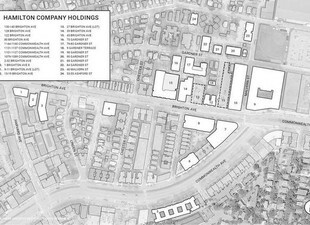 Since its founding by Brown 62 years ago, The Hamilton company, with headquarters at 39 Brighton Ave., has acquired and/or developed 24 buildings in the Packard’s Crossing area, containing 763 residential units and more than 300,000 square of commercial space. The three newly-designed adjacent developments, 40 Malvern St., 79-83 Gardner St. and 45-55 Brighton Ave., will add yet another 162 residential units, about 20,000 square feet of commercial space, and covered parking for 265 vehicles. When the additions are completed, Hamilton’s holdings in Packard’s Crossing will total 965 residential units and 320,000 square feet of commercial space. The Hamilton Company is one of Boston’s largest, privately-owned real estate companies. Its overall holdings in Boston total 3,500 residential units and more than 2 million square feet of commercial space. David Hacin of Hacin & Associates designed both the 45-55 Brighton Ave. and the 79-83 Gardner St. projects. The 40 Malvern St. project was designed by Dennis C. Rieske of Developmental Resources. Currently, 45-55 Brighton Ave. houses the Autozone retail store. The adjacent parking lot will be transformed into a 99,700-square-foot mixed-use development containing a newly-constructed, five- and six-story building with about 20,000 square feet of retail on the first floor, 76 residential units above and covered parking for 175 vehicles. Ground breaking is scheduled for spring of 2018. In addition, 79-83 Gardner St. currently houses a Victorian-style house and adjacent parking, this parcel will integrate the house with a newly-constructed, four-story residential building encompassing 47,736 square feet, 38 residential units and covered parking for 40 vehicles. The renovated Victorian home will serve as the lobby to the new building and contain a one-bedroom unit and two three-bedroom units. The remaining 35 units in the new structure will all be two-bedrooms. Ground breaking is expected next spring. The new building at 40 Malvern St., already approved by the BRA, is currently under construction and will be completed this fall. The new six-story, 49,000-square-foot building, on the site of a former parking lot, will contain 48 units, each with two bedrooms and two baths. The units will average 900 square feet and the top-floor units will have views of the Charles River. Amenities include a green roof garden, access to both a Hamilton-owned fitness facility, off-street parking and the MBTA. Rents will start at $2,600 per month. Hacin said the design and development team’s goals for Packard’s Crossing is to create a new paradigm for how urban blocks of this kind can be successfully infilled and redeveloped to reduce the impact of parking, enhance pedestrian, bicycle and vehicular connections, add green space, and strengthen the historic scale and character of the neighborhood, according to the press release.